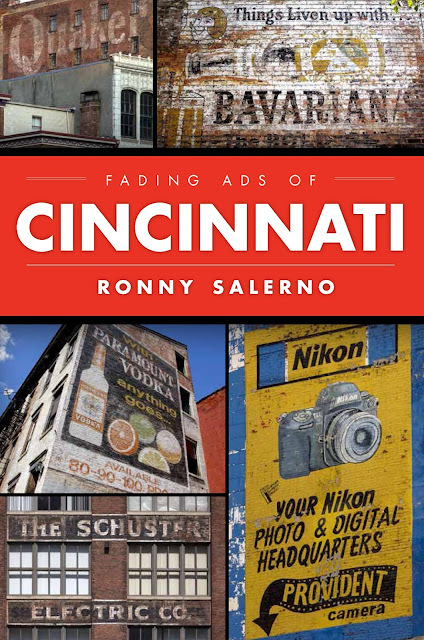 Queen City Discovery: Fading Ads of Cincinnati is Now Available! Fading Ads of Cincinnati is Now Available! Hidden down alleyways, on street corners or on the bricks above the cityscape, Cincinnati’s fading advertisements hide in plain sight. These ghost signs still tout their wares and services, remnants of a bygone era. Each sign has a vivid story behind it unique to its era, product and craftsmanship. “Wall dogs” like sign artist Gus Holthaus left their marks on the city. A sign for the Beehive, the club and restaurant at the top of the arena, reminds residents of Cincinnati’s pro hockey team, the Stingers. Not many can remember “the Other Place,” but a hand-painted advertisement still adorns a city wall. Join author and photographer Ronny Salerno for a tour of Cincinnati’s vanishing signs and their intriguing history. Fading Ads of Cincinnati is now available in stores and online! You can order through Arcadia Publishing, Amazon or Barnes & Noble (also available in store)! Did you contact each company still in existence re: your profiting from their registered trademarks? Didn't you get hugged as a child?